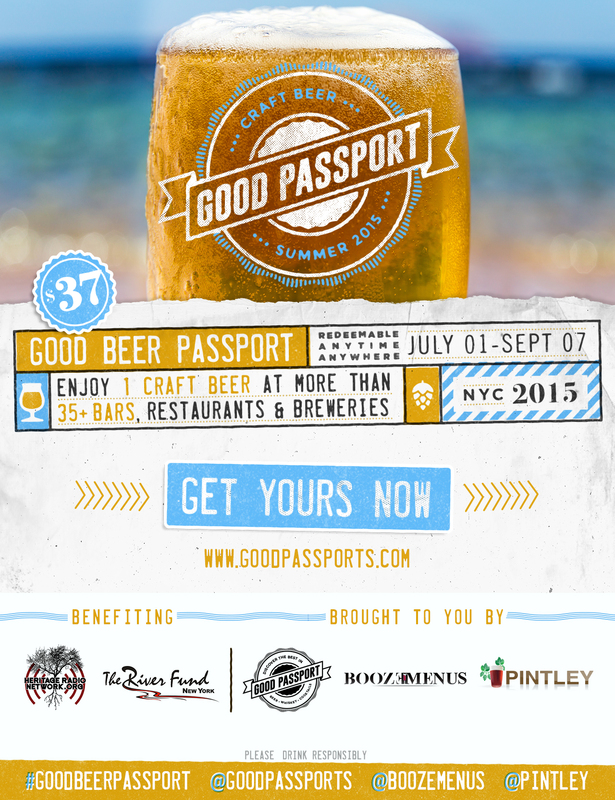 Good Passports, Pintley and BoozeMenus present The NYC Good Beer Passport Summer 2015 edition in support of July Good Beer Month. The Good Beer Passport will act as a fundraiser for The River Fund New York. A portion of the proceeds will also be donated to the Heritage Radio Network, home to Beer Sessions Radio on behalf of the Good Beer Seal. By purchasing a Passport you’ll get one full craft beer or a flight of craft beers (where flights are offered) at every location participating. You can use them any day, any time from July 1st through September 7th, 2015. When purchasing The Good Beer Passport, choose the location where you would like to pick up your Passport. Passports are available for pick up from July 1st through July 31st, 2015. As part of your purchase of The Good Beer Passport you will receive invites to special Craft Beer events happening every Tuesday night at the participating locations during the redemption period. Each event will feature local beers from breweries like Sixpoint, Gun Hill, SingleCut, Finback & The Bronx Brewery. Keep an eye on your email for invites to the tastings. Buy a ticket for the location where you would like to pick up your Passport. Bring your Passport to each of the 40+ participating locations any day from July 1st through September 7th, 2015 and choose one full pour draft or bottled beer from a local brewery (where available) or one (1) flight of four (4) 4 oz draft samples (where available) at each location. By purchasing the VIP Good Beer Passport you will get to sample 5 beers from 5 local breweries. A very limited amount of VIP Good Beer Passports will be available. To obtain the VIP Good Beer Passport, you must choose the option to pick up at the kick-off event. 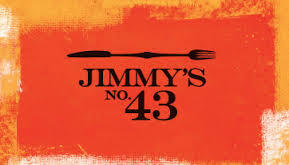 Passports purchased to be picked at the kick-off event must be picked up that day at Jimmy’s No. 43 between 6:00 p.m.-9:00 p.m. The additional $5 for the VIP Good Beer Passport will be donated to Heritage Radio Network on behalf of the Good Beer Seal. Pintley is a craft beer community connecting drinkers, brewers, and bars. Drinkers use Pintley to discover great beer. Pintley learns from your tastes, suggests beers you’ll love, and invites you to free local beer tastings where you can try them. Brewers and bars use Pintley to grow sales. Pintley’s craft beer events help bar managers fill their bars on slow nights, while helping brewery reps gain and keep draft lines. About The River Fund New York: The River Fund’s mission “to feed and empower those we serve to move beyond the lines of poverty” encompasses food and non-food needs of people living under constant ‘pressure of relentless material hardships’—which is now recognized as a better way to understand what “poverty” means in our society. People need the basic necessities of food, shelter and a sense of self-dignity. The circumstances that create persistent shortages of critical resources in people’s lives and cause them to face episodes of acute deprivation vary dramatically—ranging from the obvious, such as lack of sufficient income, to the overwhelming, like poor health or severe work-limiting health conditions. HeritageRadioNetwork.org is committed to archiving, protecting, and advancing our country’s rich food culture through programs that give voice to America’s leading food professionals, farmers, policy experts, artists, and tastemakers. The marriage between radio and Internet allows us to transmit our message like never before. The Internet gives our followers the choice of when, how, and where they listen. We have over one million listens a month and reach over 200 countries around the globe. Our social media outlets and podcasts keep our tech savvy listeners engaged, while the easy-to-use website is accessible to all. All of our shows are entered into a permanent archive creating a database of discussions on food and culture. Our archives provide an enduring record of national culture in its most basic form, food. HeritageRadioNetwork.org is a 501c3 non-profit organization that relies on the support of listeners like you! The Good Beer Seal endeavors to separate the wheat from the chaff by identifying bars that serve quality craft beer and demonstrate a commitment to the community in which they do business. A Good Beer Seal Bar is independently owned and operated and has a unique sense of place; making it more than just another watering hole. When is the 2016 summer beer passport coming out? 5 Borough Beer Crawl: Would You Pay $37 for 39 Delicious Craft Beers in NYC?